Musings from Mount Helicon: You MUST read this book—and it's not mine! 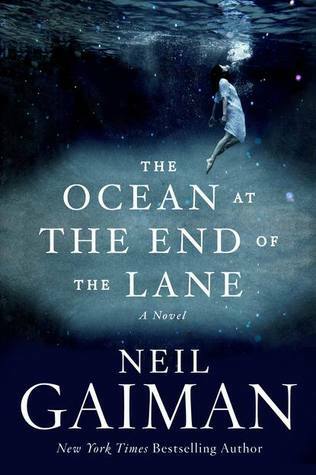 I just got off the phone with my very dear friend Randy, and we spent about an hour talking about Neil Gaiman's latest novel, The Ocean at the End of the Lane. We both are tremendous Gaiman-ites (is that a word?) and have read other works of his like Neverwhere, American Gods, and Anansi Boys. But, we both had agreed to read this latest novel as soon as it came out, and I read it in one sitting. Mind you, it's only 182 pages, but it's a read that could take you a few days to digest once you've finished it. The word that I keep using over and over when I talk about this book is that it resonates with me. My conversation with Randy simply solidified that idea as we both come from similar backgrounds in reading. I need to explain a little. The story is a frame narrative, beginning with the return of an adult man who goes back home for a funeral. While he's there, he sits by a pond (ocean? ), and the past unravels like skein of yarn. This is a children's story, but it's for adults. It's an archetype wrapped in diaphanous folds of language. I would love to meet other people who have read this novel and just talk to them about their reactions to it. I'd love to find out who their favorite characters are, too. Mine are the Hempstocks. Read the novel and find out why. Gaiman is the consummate storyteller; he doesn't just write novels. He engages his reader with glimpses of the past, of ancient archetypal ideas that ebb and flow like a literary tide. The Ocean at the End of the Lane has a firm grasp on my psyche, and it's because of my love of ancient mythologies. You see characters who embody the maiden-mother-crone archetype, and the moon/mother goddess, as well as primordial beings who have no discernible shape or substance beyond that which we ascribe to them. Gaiman's descriptions of certain predatory creatures that the reader encounters instill a fear of the dark (more of darkness incarnate, i.e. Erebus), but at the same time, a deep respect for the ancient powers that built the world. He masterfully grabs us by the throat long enough for us to feel the same trepidation of the narrator (who is unnamed), but yet, he allows us the ability of putting the book down and walking away from the images (as if we would!). One of the things Randy and I talked about was the way this novel connected with us, and I explained that I brought other stories with me in my mind that helped fill in the nooks and gaps, the stories of ancient goddesses who mind destiny or the simple control a child can have over the natural world. Those who don't have a background reading mythology will certainly enjoy this novel as Gaiman doesn't weigh it down with specific names of entities; rather, he uses more everyday, common appellations that give the feeling of familiarity or simplicity. He puts the reader at ease. Sort of. To think of this novel as a hero/villain novel would deprive it of the idea that in the grand scheme of the cosmos, true heroes and villains are more like adversaries vying for control, toying with humanity. This isn't a superhero comic book; it's Ovid or Hesiod, but through modern lens. If you've never read anything by Neil Gaiman, this novel would be a great starting off point for his style and subject matter. Then, once you've become familiar with how he thinks, move on to American Gods or Anansi Boys. I'll most assuredly read The Ocean at the End of the Lane again some time soon.